Employees in India are expected to get an average salary hike of 9.7 per cent this year, a marginal increase from last year, while top performers will get 15.6 per cent hike, as companies are focusing on performance and productivity. Human resources consultancy firm Aon’s annual salary increase survey predicts an average salary hike of 9.7 per cent across industries, as companies expect a positive economic outlook, backed by high economic growth expectation, high domestic demand, and low inflation. Conducted over 1,000 participating companies across 20-plus industries, the survey finds pay increase stabilising at single digits of 9.3 per cent in 2017, 9.5 per cent in 2018, and 9.7 per cent projected in 2019, after consistently clocking double-digit growth between 2010 and 2016. “Pay increases are marginally positive, compared to earlier years. A big highlight is the reducing difference in pay increases across industries year-on-year. 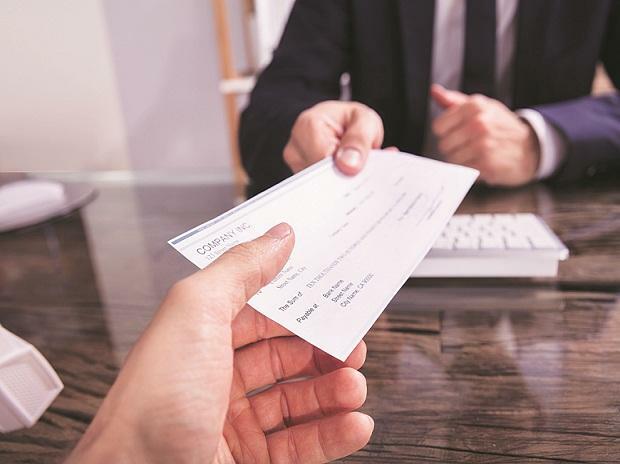 A lot of the pay increase decline is also reflected in the constant drop in voluntary attrition levels across industries,” said Anandorup Ghose, partner and head, emerging markets, Aon. While there is improvement in the overall increment projection, pay increase budgets across sectors are increasingly inclined towards the overall average. According to Ghose, this is also being reflected in expectation of head count coming down from 20 per cent to 12-13 per cent this year. “The lower pay hike shows the need in India Inc to control cost. This is being done by hiring fewer people. Moreover, bulk hiring is getting replaced by focused hiring,” said Ghose. 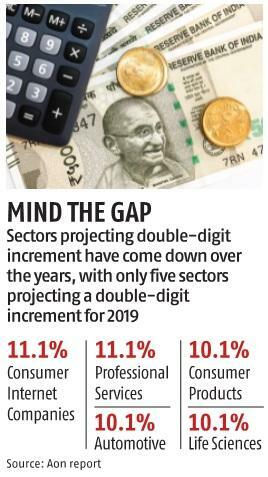 Sectors projecting double-digit increment have come down over the years, with only five sectors projecting a double-digit increment for 2019. These include sectors such as Consumer Internet Companies (11.1 per cent), Professional Services (11.1 per cent), Life Sciences (10.1 per cent), Automotive (10.1 per cent), and Consumer Products (10.1 per cent). While India Inc saw a positive shift in increment percentages, attrition continues to maintain a downward trend. Attrition has declined from 18.5 per cent in 2013 to 15.8 per cent in 2018, indicating blunting the edge of the ‘push’ forces at work. At the same time, the ‘pull’ forces have abated as well, with fewer industries attracting talent from the market. Against overall attrition, involuntary attrition has gone up from 3.5 per cent to 3.7 per cent between 2014-15 and 2018-19, and more prominently from 3.3 per cent to 3.9 per cent in the case of entry level for the same period. The survey attributes this trend to cost rationalisation as well as rising automation in certain kinds of jobs, especially in information technology (IT) and the manufacturing sector. According to Aon’s survey findings, in order to manage overall pay budgets, companies are rethinking their hiring strategy and focusing on hiring key skills, which will determine the success of the business over the longer term. As digitisation becomes the new normal, companies are investing in these niche skills to stay relevant in the changing business scenario. “Every election year presents a set of interesting dynamics in how companies plan and execute on budgets. We expect this year to be no different. But we are fairly confident that the double-digit pay increase days are well behind us, as India Inc shows maturity in managing economic and political cycles,” added Ghose. Meanwhile, from 2001-2007, the services sector has observed higher salary increases on the back of boom in sectors like IT/ITeS and banking, but after 2008-09, the manufacturing sector has gained the lead and has consistently given higher increments, given high industrial growth. Further, 2016 onwards, the divide has been slighter and the margin between the two sectors has reduced considerably to under 1 per cent on an average.